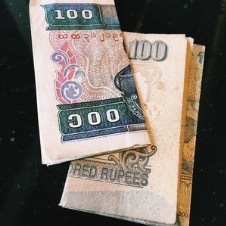 I keep a 100 Indian Rupee banknote in my wallet. It's been there for years. Yesterday, I added a 100 Burmese Kyat note. The notes serve as reminders of the generosity of strangers. Something that I've come to appreciate is more often the case than not. I offered the Indian 100 Rupee note as payment to an Indian motor mechanic. Miles from the town of Pushkar in Rajasthan, my rented motorbike seized-up, leaving me contemplating a hot, dusty and wearisome walk back to town, pushing an unwieldy and recalcitrant motorbike. However, in India, you're never alone for long. A helpful and apparently psychic group of people appeared over the sand dunes within minutes. Many hands helped wheel the bike towards a jumble of dwellings. I was offered hot, sweet chai and after taking portraits for an hour whilst the local mechanic repaired the broken bike chain, he dusted it down and proudly offered it back, fixed and ready to ride. I asked, "How much?" He shook his head. I offered a handful of 1,000 rupee notes, happy for him to take whatever he wanted. His adjustable spanner and expertise had saved me an enormous amount of trouble. He beamed a wide smile, wobbled his head in that indecipherable Indian way and declined. No amount of cajoling would persuade him that payment should change hands. At the very least, I would pay for the chai that we and his neighbours had drunk whilst he worked on my bike. But no. He wouldn't dream of it. It would have been easy to take advantage of my predicament. And I wouldn't have minded. The mechanic's expertise and time were very valuable to me and I would gladly have paid for them. It's not hard to find stories of tourists being scammed, online forums filled with complaints and warnings of touts and dangers, annoyances and pitfalls. All of which may well be accurate. But my experience over the last thirty or so years travelling to nearly 100 countries doesn't really match that picture of the world as a potentially forbidding place. There are dangers, of course, and one shouldn't ignore or minimise those but they are relatively few and far between. I'm more likely to be invited into somebody's home and offered tea than I am to be the victim of an artful scam. I find that people are as interested in me as I am in them and that an exchange of information about where we are from, who is in our family, whether we are married and what the weather is like at home is sufficient payment if it's offered genuinely and with respect. From South America to South-East Asia and at all points North, East, South and West, I've been welcomed and treated with generous hospitality by people who have much less to offer than I. A similar incident happened again yesterday. 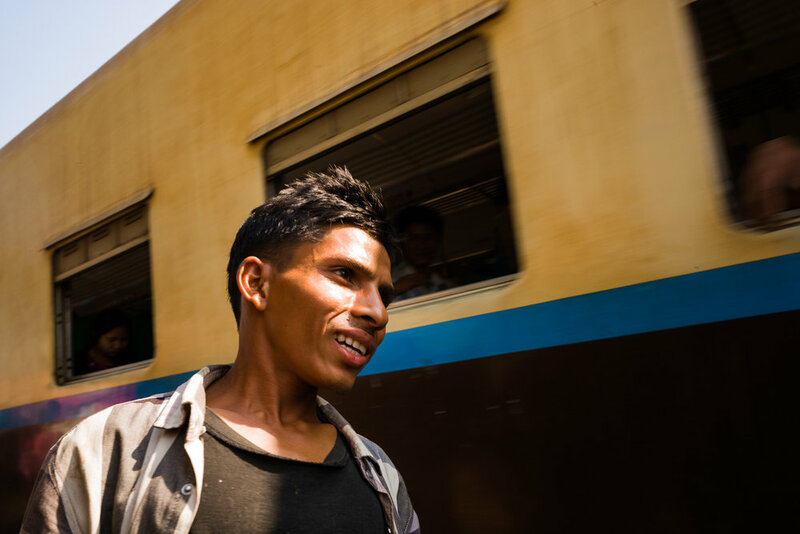 Documenting the railway that circles Yangon, I was greeted with friendly smiles, as is typically the case. After an early-morning departure and an hour on the train, I jumped off at a small village north of Yangon, where I photographed a market set up along the tracks. A young man selling fish introduced himself as Bislam. We chatted as best we could with a combined shared vocabulary of about nine words. I took some photos. I gestured towards the sun, indicating that it was very hot, knowing that my well-practised mime for "Jeez! I'm melting!" usually prompts a laugh, which it did. I went back to photographing. Two minutes later, Bislam approached me again and held out a one-litre bottle of mineral water, which he'd purchased from a nearby vendor and for which I was especially grateful. I don't always remember to stay hydrated. "Thank you. How much? ", I asked. Knowing the usual price, I fished a note from my wallet and held it out, "100 Kyat?" He smiled more broadly. "No problem." He walked back to the railway line and squatted beside the fish he was selling. He didn't try to profit. He didn't ask for 500 or 1,000 Kyat although I would have happily paid that. He didn't ask for anything at all. He didn't follow me. He didn't try to scam me, steal from me, take advantage of me or do anything beyond buying me a bottle of water. That may not seem like a lot but to put it in the context of Myanmar's economics, a three-hour train journey costs 500 Kyat and one of the fish he was selling costs a lot less. A 100 Kyat bottle of water is not insignificant. I've learned that the joy of giving is often worth more than the financial cost to people who have little material wealth. I've also learned to accept it with good grace and not to try and force the issue of payment. And so the 100 Kyat note will remain in my wallet as a reminder of that simple exchange. In a world which might often seem to generate cynicism and suspicion, I will try to remember that such simple but profound acts of generosity are not uncommon.